It's been quite a while since there was a new Ted Leo album out. I was more than happy to contribute to his Kickstarter campaign to fund The Hanged Man. In fact, I actually went in for the 7" box set version with the fourteen extra b-sides. That hasn't arrived yet, but once it does, I'll write up that as well. Point is, I'm a huge Ted Leo fan and have been ever since the day I heard the second Chisel album played in a New Jersey record store. You can have your Bruce Springsteens and Bon Jovis. For me, Ted Leo is the best musician to come out of New Jersey. That's not to say that The Hanged Man would be a guaranteed smash hit with me. When you have a musician like Ted Leo, there's always a chance he might explore his way out of me liking a song and that does happen a few times on this latest album. That's mostly because this is a very diverse set of songs. Right from the opening song "Moon Out Of Phase," Teddy's throwing curveballs. The song starts of very slow, to the point where it's a little monotone. But it seems to be gearing up to build into something frenzied, not unlike an older Chisel song "On Warmer Music." Only problem is that big release never comes. The song stays consistently slow and then just ends. There's a few other songs like this, where the tempo never picks up and I'm left wanting more. "William Weld In The 21st Century" is kind of as boring as the song title suggests, "The Nazarene" has a schlocky NPR vibe to it and "Gray Havens" is insanely slow until a completely off beat and very weird drum machine loop just drops in on top of the song. For me, it doesn't work. That being said, when Ted Leo is on and writing the sort of tunes that I tend to favor, there are few better. "Used To Believe," "Run To The City," "Anthems Of None" and "You're Like Me" are all smash hits in the more traditional Ted Leo meets Elvis Costello mod pop style that is prevalent on the earlier Ted Leo records. These songs are incredible and in some ways they shine even brighter when there are murkier moments during other portions of the album. 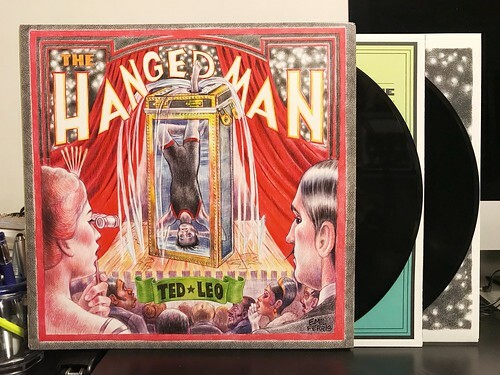 While I can't say that The Hanged Man is likely to replace The Tyranny Of Distance as my favorite Ted Leo album, it's still very good as a whole. There are parts that don't appeal directly to my sensibilities, but it's always obvious that like all great songwriters, Ted Leo has a story to tell. This time out, there's a few more stories that require a slower pace to tell than usual. Your Pest Band - Something Never Changes 7"